On February 6, 2013 President L. Rafael Reif announced his plans to launch an Institute-wide Task Force on the Future of MIT Education. On April 3, the Task Force working groups hold their opening session. Working group membership includes faculty representing all five schools, staff and both undergraduate and graduate students, with approximately 50 individuals participating as members. 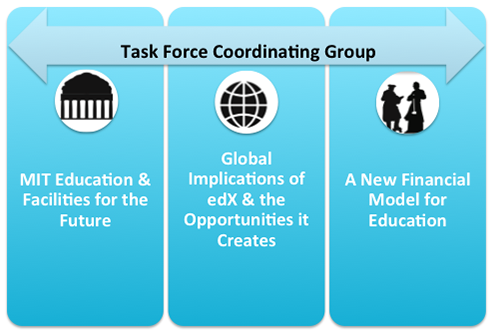 The Task Force Coordinating Group is comprised of faculty, students and staff representing the three working groups, and is designed to provide connectivity across the groups. Task Force Advisory Groups are also being formed to provide insights and recommendations as the Task Force performs its work. President Reif has asked the Task Force to complete a preliminary report of initial findings this coming fall, with a final report targeted for spring 2014. Submit an idea to the Idea Bank. Press inquiries should be directed to Kimberly Allen (allenkc@mit.edu, 617-253-2702) in the MIT News Office.